Easy to Chew Bubblegum Flavored Tablets with 3,000 IUs of D3 and other fat and water soluble vitamins to meet the Step 1 increase in patients with low vitamin D levels. *Pricing limited to the United States. Pricing outside the United States in approximately $60, in local currency. Ex-U.S. prices reflect country registration, brokerage and custom fees, taxes (e.g. VAT), shipment, and other costs that may be imposed by importing country or agency. 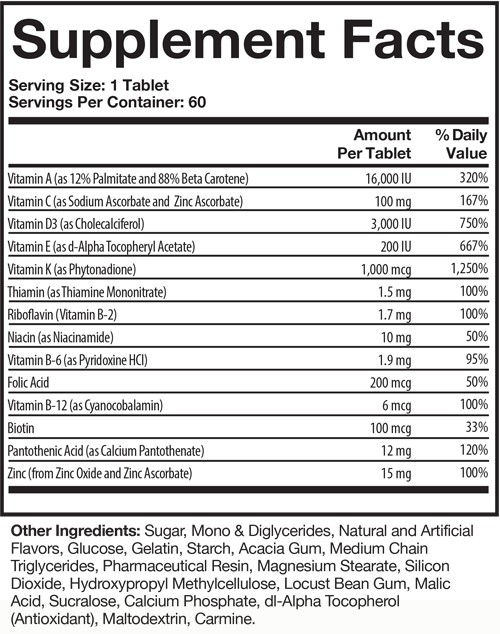 Categories: Chewables, Vitamins and Supplements. Free shipping with 3 or more bottles. Why MVW Complete Formulation Multivitamins with Zinc? The Nutrient content of the MVW Complete Formulation Multivitamins with Zinc reflect the most current nutrition evidence for person who have CF. The vitamin D content is based on the recommendations from the Endocrine Society for persons with malabsorption. 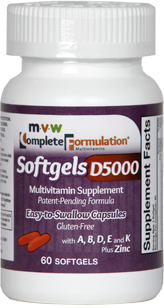 Two MVW Softgels provide 3000 IU of vitamin D3. To meet the unique vitamin K needs of persons who have CF the vitamin K content is 1600 mcg for two MVW Softgels and reflects the recommendations contained in the 2002 European CF Society Nutrition Consensus Report. Two MVW Softgels provide 20 mg of zinc. The MVW Softgels also contain vitamin A with 88% as beta-carotene, vitamin E, and a generous amount of the water-soluble vitamins and meet the recommendations in the Cystic Fibrosis Foundation Nutrition Consensus Statement published in 2002. The product contains the antioxidants beta-carotene, ascorbic acid, alpha-tocopherol, and zinc. MVW Complete Formulation D3000 Chewables1 with “ADDED D” were developed to address the CF Foundation’s September 2010 multi specialty ad hoc committee recommendations for age-specific, stepwise increases in vitamin D3 intake when optimum D status is not achieved from standard CF-specific multivitamin dosing. 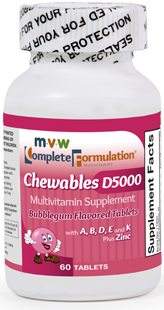 MVW Complete Formulation D3000 Chewables contain the same amounts of the fat-soluble vitamins A, E and K, and water-soluble vitamins and zinc as found in the standard MVW Complete Formulation Chewables for routine dosing, but provide 3000 IUs of D3 in each tablet to meet the “Step 1″ dose increases recommended by the CF Foundation’s September 2010 Ad Hoc Committee recommendations. Age 9 years and older: 1 chewable twice daily, or as directed by physician. Best taken with meals and supplemental pancreatic enzymes. 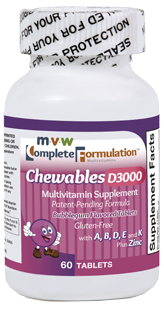 MVW Complete Formulation D3000 Chewables may be used for nutritional supplementation in individuals whose diets are deficient in the fat-soluble vitamins A, D, E, and K or who have difficulty absorbing fat-soluble vitamins as seen in cystic fibrosis.† For use solely under medical supervision. † This statement has not been evaluated by the Food & Drug Administration. This product is not intended to diagnose, treat, cure or prevent any disease. Keep out of reach of children. Use caution when administering to children. In case of accidental overdose, call a doctor or poison control center immediately. To report a serious adverse event, please contact MVW Nutritionals immediately at 1-855-236-8584. Do not use this product if you have a known sensitivity or allergy to any of the ingredients. Excessive amounts of vitamin A during pregnancy may be harmful to the fetus. Women of childbearing age should consult their physician regarding total vitamin A intake during pregnancy. Vitamin K interferes with anticoagulant medications, so persons taking anticoagulant drugs should consult with their physician before beginning use of Complete Formulation Chewables. Bottles of 60 chewable tablets. Store at room temperature (59°F – 85°F), in a dry place away from direct sunlight. Easy to Chew Bubblegum Flavored Tablets with 5000 IUs of D3 and other fat soluble vitamins to meet the Step 2 increase in patients with low vitamin D levels.